For years, Lil’ Wayne’s fans only saw his daughter Reginae as an adorable little girl. But now that she’s stepped into the world of reality TV, fans aren’t seeing her as the cute and innocent kid she once was. Of course, everyone has to grow up but since Reginae made her debut on Growing Up Hip-Hop: Atlanta, fans have seen a different side of her that they aren’t exactly fond of. In a nutshell, fans see Reginae as a spoiled brat who talks entirely too much. Since the show aired, Reginae has found herself at the center of controversy, making headlines in ways she never has before. 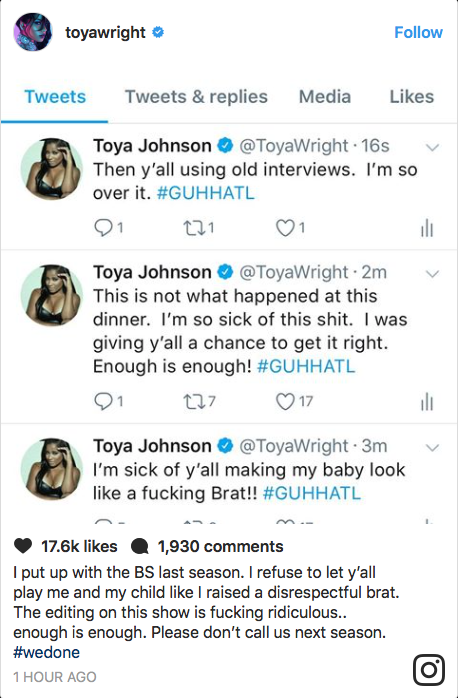 Now, her mother, Toya, is absolutely sick of the drama and her daughter being criticized by viewers. So, she took to social media with an announcement. Of course, Toya’s Twitter rant garnered an array of responses from fans everywhere. While some fans are sad to see Reginae leave the show, surprisingly, there are quite a few who are happy that she’s ending her run on reality TV. Despite Toya’s arguments and her attempt to put the blame on GUHHATL producers, fans argue there’s only so much editing that can be done and many are blaming her and Wayne for Reginae’s seemingly spoiled and entitled behavior. If it quack like a duck it’s a duck…. Do you think Reginae is spoiled? Share your thoughts.